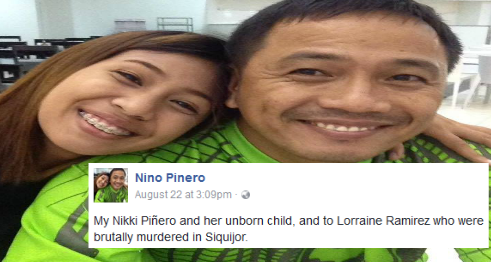 Home / Viral / Grieving father of the murder victim of drug addict slams LP, supporters: "My Nikki Piñero and her unborn child brutally murdered"
Grieving father of the murder victim of drug addict slams LP, supporters: "My Nikki Piñero and her unborn child brutally murdered"
Politicians allied with the Liberal Party have thrown their all support behind the death of kian Loyd delos Santos, a 17-year old Grade 11 student who was allegedly a drug runner for his father and uncle. Senator Risa Hontiveros, Vice President Leni Robredo, Senator Antonio Trillanes and even former Vice President Jojo Binay paid Kian Loyd wake a visit. The manner of LP politicians did not escape the eyes of the observant public, particularly the family of the victims of crimes committed by drug addicts. In a Facebook post, Nino Piñero, father of Nikki Piñero and her unborn child from Dumaguete City whose daughter died at the hands of a surfer who admitted he hwas high on drugs when he went on a stabbing spree in a resort in Siquijor last year. The post of Mr. Piñero has gone viral after he posted his sentiment on Facebook getting 1,200 shares, 2,700 reactions and 150 comments. My Nikki Piñero and her unborn child, and to Lorraine Ramirez who were brutally murdered in Siquijor. 1. Rally sa mga LP. 2. Roman Catholic Bell Ringing every afternoon sa mga drug addict to be save. 3. Wow sa mga Phil. Senators may investigation for the drug addicts but to the victims no more. Kitang-kita na kung sino talaga ang mga drug lord dito sa Pilipinas. I curse all these people that what had happened to me and my family it will happen to you.